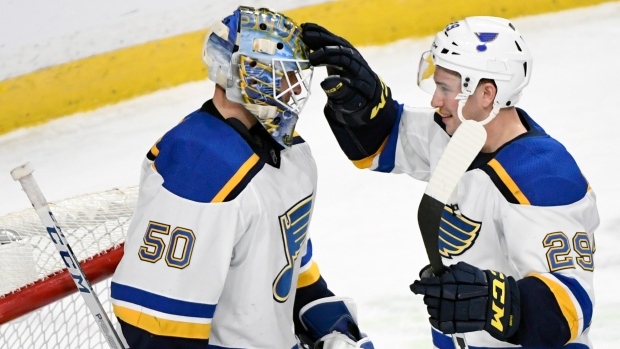 ST. PAUL, Minn. — The hottest team in the NHL keeps on winning — with a rookie goaltender helping to make history along the way. Tarasenko also had an assist on O'Reilly's goal later in the first that made it 2-0. The assist was Tarasenko's 400th point. He later picked up the assist on Schenn's second-period goal that put St. Louis up 4-0. Schenn fired the puck off Wild defenceman Nick Seeler, who slid into the net and took the puck with him. "Obviously, it's a special teams game," Wild centre Eric Staal said. "They get two power-play goals early. It's tough to come back on a team like that."